Here is a step by step guide on how to make Snickerdoodles, the soft cinnamon treat. This recipe will make approx 15 Snickertreats which are best eaten on the day they’re made. They are delicious slightly warm and with a pot of tea. Tip: Remove the butter from the fridge approximately 30 minutes before making these to allow the butter to soften. Note: The dough made from this recipe has to be chilled for 30 mins before baking, therefore, do not pre-heat your oven until you reach No. 17 of this guide. 1. Weigh out your butter and leave out on the side to soften. (Approx 30 minutes). 2. Take a mixing bowl and place the softened butter and caster sugar into it. Mix the ingredients together using a wooden spoon. 3. Take an egg and crack it into a small bowl, lightly beat it with a fork. 4. Pour the beaten egg into the mixing bowl with your butter and sugar. 5. Now add your Vanilla Essence or Extract. 6. Combine the ingredients using an electric whisk on a medium speed. 7. Once combined it should resemble gooey scrambled eggs. 8. Now weigh out the flour. 9. Pour the flour into a sieve over the mixing bowl. 10. Add the bicarbonate of soda to the sieve. 11. Now measure out the nutmeg and add this to the sieve also. 12. You can now sift the ingredients into the mixing bowl. 13. Add the pinch of salt and then weigh out your almonds or pecans and add them to the mixing bowl. 14. Start to combine the ingredients using a spatula. 15. Once the mix starts to bind, use your hand to form it into a large dough ball. 17. Now place in the fridge and chill for 30 minutes. 18. Once chilled you can then make the coating. Weigh out and place the Cinnamon and Caster Sugar into a bowl. 21. Mix the sugar and cinnamon together using a spoon. 22. Now to prepare your baking tray, cut out a sheet of baking paper roughly the same size as your tray. Pre-grease your tray with oil or butter; I used cake release. Then place your baking paper on top of the greased tray and press down for it to stick. 23. 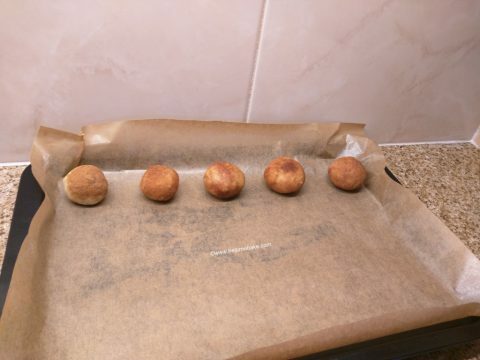 Take your chilled snickerdoodle dough ball and pull off some of the dough, roll it into a small ball in your hands and then roll in the topping. 24. Coat both sides (I then re-rolled them in my hands to roll in the coating thoroughly) place on the baking sheet on the tray leaving a space between them. Do this until you have made approx 15 balls. 25. Now place on the middle shelf of your preheated oven for approx 11-12 minutes. 26. Once baked remove from the oven and leave to cool slightly on the baking tray for approx 2-3 minutes then transfer to a wire rack. 27. I enjoyed these somewhat warm; they are lovely with a pot of tea. 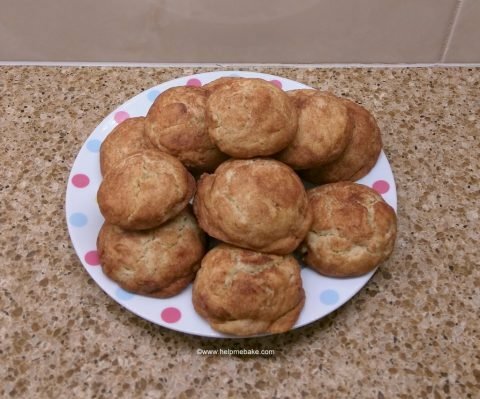 The snickerdoodles are slightly crisp on the outside and have the texture of an English Scone on the inside. This recipe can be doubled up to make more.